According to the Food and Agriculture Or-ganization (FAO), the global fisheries production (catch and aquaculture) in 2008 was estimated to be around 110 million tonnes, with a global catch exceeding 76 million tones (FAO, 2010). It is es-timated that 25% of this global production is re-garded as waste and is discarded (Shahidi, 1994) or in the best case scenario processed into fish oil, fishmeal or pet food (Kim and Mendis, 2006). Fish waste is costly to dispose of and is typically discarded overboard in case of onboard processing or buried to landfill for the on-shore processing. In both cases and due to its high content of organic matter, fish waste disposal may cause severe health and environmental is-sues and is an increasing cost for the whole sea-food industry (Jespersen et al., 2000). Moreover, the European Union legislation (Regulation (EC) No.1774/2002) restricts the disposal of animal by-products not intended for human consump-tion. Therefore more sustainable alternatives are needed. Recycling fish waste is of interest from an en-vironmental point of view by reducing the organic contaminant charge. Recent advances in fish waste management have resulted in their ex-amination as a source of ingredients with a potential application to the food industry. Many studies have found an important number of bioactive compounds remaining in fish and shellfish waste (Kim et al., 2008). Fish waste is a potential source of gelatine which can be extracted from skin, bones, scales or connective tissue (Kim and Mendis, 2006). Gelatine is produced by extraction and hydrolysis of the fibrous and insoluble collagen. Collagen is the main protein of animal tissues and represents approximately 30% of total animal protein (Muyonga et al., 2004). The extraction of gelatine requires an alkaline or an acid treatment to achieve the cleavage of collagen cross links followed by extraction with warm water. The heat treatment is necessary to destabilize the triple helix configuration of collagen and to convert its helical conformation into a coiled con-formation, resulting in a gelatinous state when cooled (Djabourov et al., 1993). Previous work has investigated the effect of organic acid on the extraction of gelatines. A lot of work has been done on the extraction of gela-tines from fish with acetic, citric, lactic formic, propionic, malic and tartaric acids (Arnesen and Gildberg, 2007; Giménez et al., 2005; Gómez-Guillén and Montero, 2001). However, few stu-dies have focused on gelatine from fish heads (Arnesen and Gildberg, 2006; Kolodziejska et al., 2008). Most of the published data is about gelatines from fish skins (Arnesen and Gildberg, 2007; Cheow et al., 2007). 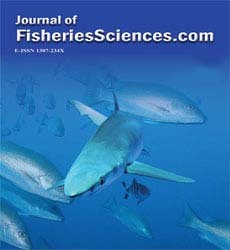 The main objective of the present work was to explore the possibility of gelatine extraction from mackerel heads using different organic acids (acetic, citric, lactic, malic and tartaric acids) and to evaluate the effect of the pre-treatment on the physicochemical properties of the extracted gela-tines. Atlantic mackerel (Scomber scombrus) used in the present work were kindly provided by Bord Iascaigh Mhara (BIM, Ireland). The fish were caught in Ireland in the area of FAO 27 during March 2007. Mackerel were medium size and the average weight was 277±94.7g. Mackerel heads were separated from the fish and ground using an Officine meat mincer model 12 mec (Officine C.G.T., Milan, Italy). The ground mackerel heads were divided into batches and kept in the freezer at -20 °C until use. All chemi-cals used were analytical grade. Gelatine extraction was carried out according to the method of Gómez-Guillén and Montero (2001) with some modifications. The minced fish head material (~ 1.5 Kg) was treated at room temperature with 0.1 N NaOH to remove non-collagenous proteins and pigments (in a ratio of 1/3, w/v, for 30 min and repeated 3 times) and washed with distilled water each time until the drained water had a neutral pH. Different organic acids, acetic, citric, lactic, malic or tartaric acid at 0.05 M were added in parallel to the clean heads in the ratio of 1/3 (w/v) for 4 hours. The material was washed under running water from a tap, and the gelatine was extracted at 45 °C overnight with distilled water (in a ratio of 1/3, w/v). All extraction steps were done under continuous stir-ring at 150 rpm. Extracted gelatine was filtered using a Whatman No.4 filter paper (Whatman, Maidenstone, England) with a particle size reten-tion of 20–25 μm. Gelatine was then evaporated under vacuum at 45 °C using a Büchi Rotavapor model R-210 fitted with a Büchi temperature-controlled water bath model B-491 and Büchi vacuum system model V-700 (Büchi UK Ltd., Oldham, UK) and freeze dried. The proximate analysis was carried out ac-cording to the procedures of the Association of Official Analytical Chemists (AOAC, 2000). Protein content was determined by the Kjeldahl method using an automatic Kjeldahl system (Gerhardt, Bonn, Germany). The nitrogen con-version factors were 6.25 for mackerel heads and 5.4 for gelatines (Eastoe and Eastoe, 1952). Moisture was determined by drying the sample using an oven (Qualivac, Greenfield Oldham, UK) until reaching a constant weight (at 100 °C for 18 hours) and ash by incineration in a muffle furnace (Carbolite, Bamford Sheffield, England) at 550 °C for 4 hours. Lipid content was deter-mined according to the Bligh and Dyer method (Bligh and Dyer, 1959). All analyses were per-formed in triplicate. Solutions of 1% (w/v, on a protein basis) of raw material (mackerel heads) and each gelatine sample were prepared with distilled water then filtered using a Whatman No.4 filter paper. The pH of the filtrate was measured using Orion pH meter Model 420A (Orion Research Inc, Beverly, MA. USA). Gelatine extraction yield was calculated as g of dry gelatine per 100 g of clean mackerel heads (Giménez et al., 2005). The electrophoresis procedure was carried out according to Gómez-Guillén et al. (2002) with minor modifications. Gelatine solutions were made as 5 mg/mL in distilled water at 60 ºC and then diluted to a final concentration of 2 mg/mL with sample buffer containing β-mercaptoethanol (Sigma, Dublin, Ireland). Gelatine samples were heated to 85 ºC for 10 min to denature the proteins. Samples and mole-cular weight marker (10 μL each) were then loaded onto SDS-PAGE having a 4% stacking gel and 10% resolving gel according to Laemmli (1970). The analysis was run in an Atto Dual Mini-slab Size Electrophoresis Systems AE-6450 (Atto Corporation, Tokyo, Japan) at a constant current of 25 mA/gel. The gel was immersed in a fixative solution prepared with distilled water, methanol and acetic acid (50:40:10, v/v/v) for 1 hour, and then protein bands were stained with Coomassie Brilliant Blue R250. The gel was de-stained using a mixture of isopropanol, acetic acid and distilled water (12:10:78, v/v/v). The molecular weight marker (Sigma, Dublin, Ireland) contained a lyophilized mixture of six proteins: bovine carbonic anhydrase (29 kDa), egg albumin (45 kDa), bovine albumin (66 kDa), phosphorylase B from rabbit (97.4 kDa), β-ga-lactosidase from E. coli (116 kDa) and myosin from rabbit muscle (200 kDa). The amino acid profile was determined ac-cording to the method of Giménez et al. (2005), with some modifications. Briefly, 10 μg of gela-tine was hydrolyzed for 24 h at 110 °C, with 6M HCl containing 0.1% phenol. Norleucine (Sigma, Madrid, Spain) was added as an internal standard. The amino acid composition was ana-lysed using a cation exchange Biochrom 20 amino acid analyzer (Pharmacia Biotech, Ltd., Cambridge, England) with postcolumn derivati-zation with ninhydrin. The amino acids were de-tected and quantified at 440 and 570 nm. Results were averaged and presented as percentage (g amino acid / 100 g gelatine). Freeze dried gelatines (approximately 2 mg) were mixed with 100 mg potassium bromide (KBr) then transferred to a hydraulic press to prepare small discs. The discs were placed in the FTIR spectrometer Model Avatar 360 (Thermo-Nicolet, Madison, Wisconsin, USA). FTIR spec-tra (32 scans) were analysed in the transmission mode, between 400 and 4000 cm−1 with a resolu-tion of 2 cm−1. The spectra were analysed using Omnic 5.0 software (Thermo-Nicolet, Madison, Wisconsin, USA). Proton NMR (1H NMR) spectra were per-formed on freeze-dried gelatine samples; ap-proximately 200 mg of each gelatine sample were dissolved in 2 mL of D2O and mixed by shaking. An aliquot of this mixture was transferred into a 5 mm NMR sample tube and analysed by a Bruker Avance 500 MHz spectrometer equipped with 4 mm 1H HR-MAS probe, at 300 ºK and 10 KHz and using a pre-saturation sequence for wa-ter suppression. Data were acquired using Bruker topsin software version 2.1 (Bruker UK Limited, Coventry, UK). Resonance assignments were based on chemical shifts. The turbidity of the gelatine samples was measured as formazin turbidity units (FTU) using a DR/2000 Spectrophotometer (Hach Co., Lovel-and, CO, USA). Gelatine was first dissolved in distilled water at 60 ºC to 1% (w/v, on a protein basis) solution, then 25 mL of sample was trans-ferred into the transparent glass cell (dimension 2.5cm×2.5cm×5cm) and the absorption was read at 450 nm. The instrument was calibrated with formazin standards prepared from a 4000 NTU stock solution (Hach Co.). Measurements were performed in triplicate. The color of gelatines was determined using a LAB Colorquest XE colorimeter (Hunterlab, Virginia, USA). Gelatine solutions were prepared to a concentration of 1% (w/v, on a protein basis) using distilled water at 60 ºC then 25 mL was transferred into the transparent glass cell (dimen-sion 2.5cm×2.5cm×5cm). The parameters meas-ured were L* (lightness value), a* (green-red) and b* (blue-yellow). ANOVA (Multifactor and one-way) was used to find differences between treatments. Means were compared by significant difference (LSD) test, at a significance level of 0.05 using the Stat-graphics Centurion XV software (version 15.1.02; StatPoint, Inc., Virginia, USA). Three independent trials were carried out. The raw material (mackerel heads) had a pro-tein content of 16.3 ±0.1%, a moisture content of 65.3±0.3%, a fat content of 14.2 ±0.1% and an ash content of 4.3 ±0.2%. Similar composition was reported for the white and dark muscle of mackerel (Scomber scombrus) with a protein content of 18.9 and 17.3%, a moisture content of 71.5 and 68.1%, a fat content of 9.1 and 14.1% and an ash content of 1.2 and 1.1% for white and dark muscles, respectively (Leu et al., 1981). The relatively higher ash content in this study is probably due to minerals from the bones in the heads. Reported data for chub mackerel (Scomber japonicus) showed a higher protein content of 21.38%, also a higher moisture content of 71.8% and an ash content of 2.26% (Mbarki et al., 2009). These differences may be due to the vari-ation among species. The pH value of the mackerel heads was 6.1 ±0.1 which was in agreement with the values of 6.18 and 6.06 for chub mackerel (Scomber japonicus) reported by Goulas and Kontominas (2007) and Metin et al. (2001), respectively. The proximate analysis and the pH of gela-tines (1%, w/v) extracted from mackerel heads using different organic acids are presented in Table 1. Table 1: Proximate analysis, pH and recovery yields of gelatines from mackerel heads extracted after pre-treatment with different acids. The pH values varied significantly (p<0.05) from 4.3 to 6.2 depending on the organic acid used in the extraction. Gelatines extracted from mackerel heads after pre-treatment with acetic acid had the highest pH 6.2 which was very sim-ilar to the pH of gelatines extracted from horse mackerel (Trachurus trachurus) using a mixed acid and alkali process (Badii and Howell, 2006). No significant (p>0.05) differences were ob-served among the pH of the rest of gelatines. Gelatines from other fish species had lower pH value. Gundmundsson and Hafsteinsson (1997) reported that pH of gelatine from cod skins ex-tracted using sulphuric and citric acids varied between 2.7 and 3.9. Differences in pH of the gelatine were due to the type and strength of ac-ids employed during the extraction procedures. All gelatine samples had low moisture content and there was no significant (p>0.05) differences among the moisture contents of extracted gela-tines. The protein content of gelatines was in gen-eral high. Gelatines extracted from mackerel heads after pre-treatment with acetic, citric and lactic acids showed significantly (p<0.05) higher protein contents (89.4%, 87.4% and 88.5%, respectively). Gelatines extracted from fish are usually high in protein. Muyonga et al. (2004) reported that the protein content of gelatines derived from skins and bones of young Nile perch were 88.8% and 83.3%, respectively. Whereas, gelatines derived from skins and bones of adult Nile perch had protein contents of 88.0% and 78.4%, respectively. Additionally, gelatine from skins of Bigeye snapper and Brownstripe red snapper had protein contents of 87.9% and 88.6%, respectively (Jongjareonrak et al., 2006). All gelatines were generally low in ash, the calculated value were lower than the recom-mended maximum of 2.6% (Jones, 1977). The lipid content of extracted gelatines was less than 1%. The yield of gelatine was expressed as percentage in a wet basis. No significant (p>0.05) differences were observed among the extraction yields. Only slight differences were observed depending on the organic acid used. Mackerel heads pretreated with citric acid gave a higher gelatine extraction yield (3.7%), followed by lactic and malic acids (3.5%). Mackerel heads pretreated with acetic and tartaric acids showed the lowest gelatine extraction yields (3.3%). Giménez et al. (2005) examined the ability of lactic acid compared to acetic acid to extract gelatine from Dover sole (Solea vulgaris) skin and the yield using lactic acid was slightly lower than that using acetic acid. The difference between the yields, which depends on the nature of the organic acid, could also be due to losing collagen during the washing step (Cheow et al., 2007). The type of acid affects the pH of the extraction solution, which affects the swelling and the breaking of covalent bonds in the collagen cross-links of the raw ma-terial (Gómez-Guillén and Montero, 2001). The electrophoretic (SDS-PAGE) profiles of the various gelatine preparations are shown in Figure 1. The gel electrophoresis showed the presence of the three bands that correspond to gelatine, one β chain with a molecular weight of 175 kDa and two α-chains (α1 upper and α2 lower) both with molecular weights of about 127 and 117 kDa, respectively. These three major chains are characteristics of type I gelatines. Similar SDS-PAGE patterns were observed for other fish species (Gómez-Guillén et al., 2002). Figure 1: SDS-PAGE patterns of gelatines from mackerel heads extracted after pre-treatment with different acids. There was no difference in the relative mobility of the β and α-chains among gelatines prepared with the different organic acids. This indicates that the organic acid did not affect the molecular weight distribution of β and α-chains. However, the presence of low molecular weight proteins, observed in gelatines extracted after pre-treatment with acetic and lactic acid, may be due to a partial degradation of protein during the heating step in the gelatine extraction process (Gimenez et al., 2005). 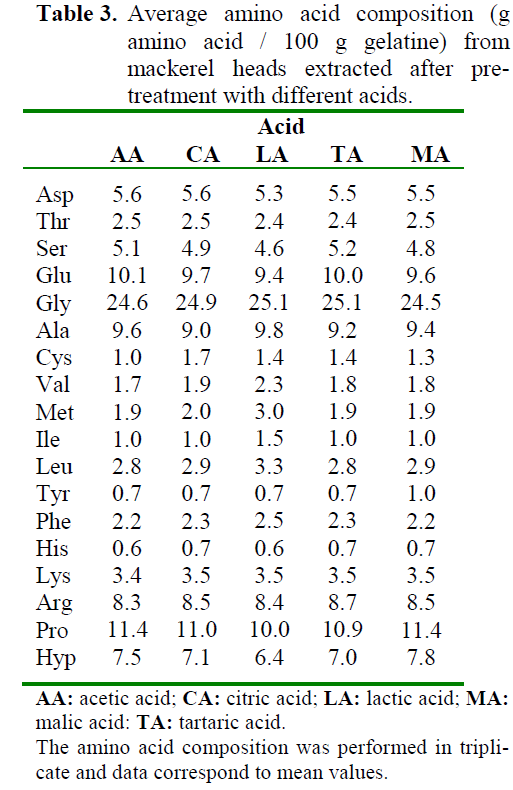 The average amino acid composition of mackerel heads gelatines, expressed as percentage, is shown in Table 2. It was observed that the amino acid composition was similar in all gelatines. All extracted gelatines had glycine as the major amino acid. High contents of proline (varying from 10 to 11.4%), hydroxyproline (varying from 6.4 to 7.8%), alanine (varying from 9.0 to 9.8%) and glutamic acid (varying from 9.4 to 10.1%) were also observed. Slight differences in amino acid contents, due to the organic acid, were observed mainly in proline and hydroxyproline levels. In particular, gelatine extracted from mackerel heads after pre-treatment with lactic acid had the lowest proline and hydroxyproline content (10% and 6.4%, respectively). All gelatines were very low in tyrosine and histidine. These results were in agreement with those found by Kim and Park (2004) for acid-soluble collagen from Pacific whiting. However, relatively high contents in cysteine were observed giving an indication of possible contamination by non-colla-genous proteins in the extraction process (Mori-mura et al., 2002). In this study, the glycine content ranged from 24.5% (for gelatine extracted after pre-treatment with malic acid) to 25.1% (for gelatine extracted after pre-treatment with lactic and citric acid). The imino acid content (proline + hydroxypro-line) ranged from 16.4% (for gelatine extracted after pre-treatment with lactic acid) to 19.2% (with gelatine extracted after pre-treatment with malic acid). Badii and Howell (2006) found that gelatine from horse mackerel had higher glycine content (31.6%) but the level of proline and hy-droxyproline were very similar to the present study (12.5% and 7.4%, respectively). Results reported by Muyonga et al. (2004) showed imino acid contents of 19.28% and 20.05% for gelatines from young and adult Nile perch, respectively. The amount of imino acids plays a major role in the rheological properties of gelatines. Gelatines with low proline and hydroxyproline level usually show lower melting point and weaker gel network (Gilsenan and Ross-Murphy, 2000; Johnston-Banks, 1990). 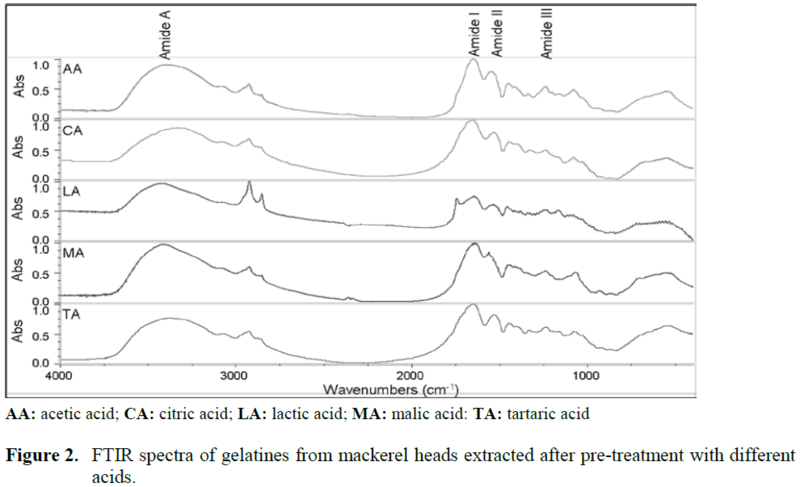 Gelatines from mackerel heads were analysed using FTIR. The absorption bands in the FTIR spectra were situated in the amide band region (Figure 2). Amide I and amide II bands of mack-erel heads gelatines appeared around 1650 and 1540 cm-1. Amide I and amide II of type B gela-tine from bovine skin were also observed at 1700–1600 and 1560–1500 cm-1 as reported by Yakimets et al. (2005). Figure 2: FTIR spectra of gelatines from mackerel heads extracted after pre-treatment with different acids. Infrared absorption of proteins around 1200 cm-1, 1500 cm-1, 1700 cm-1, and 3500 cm-1 are typical for the amide III, II, I and A vibra-tional modes, respectively (Hayashi and Muka-mel, 2008). C=O and N-H bond stretching are mainly present in the amide I and A regions, re-spectively. The C-N stretching and H-N-C bend-ing usually appear in the amide II and III bonds (Hayashi and Mukamel, 2008). In the present study, all gelatines had similar FTIR profile. Dif-ferences among gelatines were observed in the relative intensity of the peaks as well as in amide frequencies. These differences could be attributed to the effect of organic acid used in the extraction procedure and it is an indication of degradation of the collagen (Muyonga et al., 2004). The peaks of amide I and II of gelatine from mackerel heads extracted after pre-treatment with malic acid were at higher frequencies (1653 cm-1 and 1560 cm-1, respectively) than peaks of amide I and II from gelatine extracted after pre-treat-ment with acetic acid (1651 cm-1 and 1541 cm-1, respectively), citric acid (1648 cm-1 and 1541 cm-1, respectively), lactic acid (1647 cm-1 and 1534 cm-1, respectively) and tartaric acid (1637 cm-1 and 1538 cm-1, respectively). The higher frequen-cies for amide I and II of gelatines extracted after pre-treatment with malic and acetic acids suggest a higher degree of molecular order and better sta-bility (Payne and Veis, 1988). Gelatine extracted from mackerel heads after pre-treatment with lactic and tartaric acids had the lowest amide I, II and III intensities which may indicate a greater degree of peptide cleavage and deamidation of asparagine and glutamine leading to the alteration of the triple helix (Freiss and Lee, 1996). A significant higher peak around 2930 cm-1, corresponding to the CH2 stretching band, was observed for gelatine extracted after pre-treatment with lactic acid. This peak was less predominant and slightly merged with the amide A band for gelatines extracted after pre-treatment with citric, acetic, malic and tartaric acids which may indicate a better stability of the components of these gelatines (Kemp, 1987). Figure 3 shows the 1H NMR spectra of gela-tines from mackerel heads extracted after pre-treatment with acetic, citric, lactic, malic and tartaric acids. A large number of signals were overlapped which could be due to partial degra-dation of gelatine caused by the organic acid used in the extraction. According to Williamson and Asakura (1997), in denatured proteins, most nuclei resonate at frequencies similar to those ob-served in small peptides, and therefore show a considerable degree of overlap and a lack of spectral dispersion. Figure 3: 1H NMR spectra of gelatines from mackerel heads extracted after pre-treatment with differ-ent acids. In this study, the NMR spectral domains were identified as amino acids, mainly glycine and proline. Glycine had chemical shifts of 4.66 and 3.42 ppm and proline had chemical shifts of 4.43, 2.28 and 2.04 ppm. A large number of resonances with considera-ble overlap are present in the upfield region. The chemical shifts from 0.5 to 1.5 ppm, represent aliphatic protons that are attached to carbon atoms of valine, leucine and isoleucine. The re-gion from 1.5 to 3.0 ppm, represents protons on aliphatic carbon atoms of arginine, leucine, ly-sine, proline, glycine, asparagine and aspartic acid. The region between 3.2 and 4 ppm represents the resonance signals of the α-CH of the amino acids. The last portion of the 1H NMR spectrum represents the aromatic region (7-8 ppm) and represents phenylalanine. Differences among gelatines were observed, mainly in the relative intensity of the peaks, which could be due to the effect of organic acid used in the extraction procedure. Also slight vari-ations among the chemical shifts of the same amino acid, but in different gelatines, were noted. These differences could be due to the organic acid used which affects the secondary structure of gelatine. 1H NMR was also used to trace the presence of the organic acid used in the extraction. Acetic acid (AA) generated a chemical shift at 2.00 ppm, citric acid (CA) had chemical shifts at 3.02 and 2.84 ppm (Figure 3). Lactic acid (LA) had chemical shifts at 4.09 and 1.33 ppm, tartaric acid (TA) showed a chemical shift at 4.31 ppm and malic acid (MA) had chemical shifts at 2.35, 2.65 and 4.26 ppm (Figure 3). The color of gelatines (Table 3) were signifi-cantly (p<0.05) affected by the organic acid used in the extraction process. Table 3: Average amino acid composition (g amino acid / 100 g gelatine) from mackerel heads extracted after pre-treatment with different acids. Gelatines obtained from mackerel heads after pre-treatment with different organic acids had similar L* and a* values. Gelatine extracted after pre-treatment with acetic acid had significantly (p<0.05) highest b* values indicating a more yellowish color. Although all acids were at the same concentration (0.05 M), the pH of acetic acid solution was higher (3.1) than the pH of malic (2.3), lactic (2.3), citric (2.2) and tartaric (2.2) acids. It seems that the pH significantly (p<0.05) affects the color of the gelatine. Zhang et al. (2007) reported that pre-treatments at acidic solution prior to the main extraction resulted in transparent gelatine, whereas pre-treatments at basic solution prior to the main extraction resulted in dark-colored gelatine from Channel Cat-fish (Ictalurus punctatus). The dark color of the gelatine may be reduced by deceasing the extrac-tion time, since long reaction times favors the Maillard reaction between protein and traces of carbohydrates in the raw material (Schrieber and Gareis, 2007). The range of turbidity values recorded in this study (Table 3) was very wide (121-176 FTU). Gelatine extracted from mackerel heads after pre-treatment with lactic acid showed significantly higher turbidity values (176±3.2 FTU). These re-sults were in agreement with those reported by Gimenez et al. (2005) for gelatine from Dover sole (Solea vulgaris). These authors found that the use of lactic acid induced the solubilisation of material with a high degree of aggregation and as a consequence higher turbidity value. The high turbidity values observed with lactic acid pre-treated gelatines may also be due to the deamidation of asparagine and glutamine amide residues. During the preparation of gelatines, the deamidation of asparagine to aspartate and glu-tamine to glutamate takes place. However, the conversion of protein amide groups to carboxyl groups during the deamidation of asparagine and glutamine amide residues affects both the charge and the hydrophobicity of gelatine by introducing negatively charged carboxyl groups (Lindner and Helliger, 2001). This leads to a decrease in the isoelectric point (Miwa et al., 2010). It was re-ported that the gelatine type A or acid-processed gelatine has an isoelectric point that can vary from 6.5 to 9.0 whereas gelatine type B or alka-line-processed gelatines has an isoelectric points found over a narrower pH range, typically 4.8 - 5.0 (Johnston-Banks, 1990; Foegeding et al., 1996). When the pH reaches the isoelectric point, large dipoles of protein molecules attract themselves through the counter charged domain and there is no electrostatic repulsion between neighbouring molecules. As a consequence, pro-tein molecules tend to precipitate (Milewski, 2001) resulting in higher turbidity. The organic acid, used in the extraction process of gelatines from mackerel heads, af-fected the properties of the gelatines especially the color, turbidity as well as the yield (~ 3.5%). For increased clarity of the gelatine, the use lactic acids to assist extraction should be avoided. In terms of improving the visual appearance, acetic acid should not be used. Although no difference in the molecular weight distribution of gelatine was observed, the amino acid composition varied depending on the organic acid used. Lactic acid pre-treatment negatively affected the imino acid (proline and hydrolxyproline) level, which could negatively affect the rheological properties of these gelatines. Therefore, citric and malic acids were the most suitable acids to use in the extrac-tion of gelatine from mackerel heads with better physicochemical properties. AOAC, (2000). In: Horowitz, W. (Ed. ), Official Methods of Analysis of AOAC International. Association of Official Analytical Chemists International: Gaithersburg, MD. Djabourov, M., Lechaire, J. P., Gaill, F., (1993). Structure and rheology of gelatin and colla-gen gels, Biorheology, 30: 191-205. Eastoe, J.E., Eastoe, B., (1952). A method for the determination of total nitrogen in proteins. In: The British Gelatin and Glue Research Association Research Report, Series B 5. Nature publishing group: London, UK, pp. 1-17. FAO (2007). Fisheries Department, Fishery In-formation, Data and Statistics Unit. Fishstat Plus: Universal software for fishery statis-tical time series. Global Production Statistics 1950-2007. Jespersen, C., Christiansen, K., Hummelmose, B., (2000), Cleaner production assessment in fish processing. Prepared by COWI con-sulting engineers and planners AS. United Nations Environment Programme & Danish EPA: Paris, France, pp. 99. Johnston-Banks, F.A., (1990). Gelatin. In: Harris, P. (Ed.). Food gels. 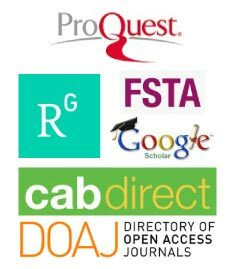 Elsevier Applied Science Publishers: London, UK, pp. 233-289. Jones, N.R., (1977). Uses of gelatin in edible products. In: Ward, A., Courts, A. (Eds. ), The science and technology of gelatine, Academic Press Inc: London, UK, pp. 366-394. Kemp, W., (1987) Organic Spectroscopy. Mac-millan Education Ltd: Hampshire, UK, pp. 299. Kim, S.K., Mendis, E., Shahidi, F., (2008) Ma-rine fisheries by-products as potential nutra-ceuticals: an overview. In: Barrow, C., Sha-hidi, F. (Eds.) Marine nutraceuticals and functional foods. CRC / Taylor & Francis: Boca Raton, FL, pp. 1-22. Milewski, S., (2001). Protein structure and physi-cochemical properties. In: Sikorski, Z.E. (Ed), Chemical and Functional Properties of Food Proteins. Lancaster, PA, Technomic Publishing Comp. Inc. pp. 35-56. Regulation (EC) No.1774/2002 of the European Parliament and of the Council of 3 October 2002 laying down health rules concerning animal by-products not intended for human consumption. Official Journal L273, 2002; pp.1-95. Schrieber, R., Gareis, H., (2007). Gelatine Hand-book: Theory and Industrial Practice. Wi-ley-VCH GmbH & Co, Weinhem, Germany, pp. 334. Shahidi F., (1994). Seafood processing by- prod-ucts. In: Shahidi, F., Botta, J.R. (Eds. ), Sea-foods chemistry, processing, technology and quality. Blackie Academic & Professional; London, UK, pp. 320-334. Williamson, M.P., Asakura, T., (1997). Protein chemical shifts. In: Reid, D.G. (Ed.) Protein NMR Techniques (Methods in Molecular Biology). Humana Press:Totowa, NJ, pp. 53-59.